"Lying under a coconut palm may seem like a tropical idyll, but there have been some tragic accidents. Take care when walking under coconut trees and don't lie (or park your car) beneath them." I now know why it’s impossible to rent a car in Madagascar. For about a month before I arrived in Tana, I had been in touch with all of the rental agencies trying to locate a small, cheap car for the week I would be there. But in Madagascar, you can’t rent just a car – instead, you hire the car and a driver together. So, this is how I ended up spending four days of my time in Madagascar riding shotgun with Rebe, a driver I hired through a recommendation at one of the hotels in the capital. Our negotiation was quick: I told him where I wanted to go and for how long, he quoted a price, I knocked off 25% - to make the offer a bit lower than the price charged by the major rental agencies, except Rebe’s price included the petrol – and he agreed immediately. There is nothing worse than having a counter-offer immediately agreed to, and I knew that I paid more than I needed to. But Rebe turned out to be well worth the money. Driving in Madagascar is a sport. It’s a test of dexterity, agility, and endurance, and it requires the right combination of patience and aggressiveness, knowledge of the local roads, and a sense of humor. It’s probably best for tourists, Malagasy, and the cars themselves that foreigners don’t drive. For four straight days, Rebe piloted his red Ford station wagon through the Madagascar towns and countryside, handling the hazards and distractions in, on the side of, and beyond or past the roadside. What’s in the road depends on where you are. Getting out of Tana – which could take between 30 and 90 minutes, depending on the time of day – the road is thick with traffic and people, mainly vendors selling whatever you could possibly imagine and taxi brousse, the Malagasy equivalent of an African combi. As we leave Tana the crowds thin, the scenery changes, and the obstacles in the road change. Rebe puts on his old MP3 player, which has about 50 songs on it – a combination of 90’s American dance music (think Vanilla Ice, and other hits from the early 90’s bar mitzvah circuit) and French/Malagasy electronic – which he knows quite well. There’s one song, part in English and part in French, which I gather is called “Chihuahua,” that Rebe seems to like. It’s on the playlist multiple times, and Rebe starts to whistle to the melody when it comes on. We’re on a “good road” – it is sealed and wide enough for a lane in each direction, but it still has its share of large potholes and the occasional unmarked speed bump (a Swazi specialty, no doubt, that has made its way to Madagascar), of which Rebe seems to know each one. Here, instead of the armies of people and vendors, Rebe now navigates the curves of the road bending around the hills and mountains, and whatever else ends up blocking our path. We are likely to come across a pack of cattle being shepherded by young boys to a pasture, an overloaded taxi brousse or large truck chugging slowly up the side of a hill, or a pousse pousse, or rickshaw, especially if we are in or close to Antsirabe, where there seems to be a rickshaw for each of the 150,000 living there. When there’s something in our way, Rebe taps on his horn. This first toot is polite – friendly even – and most often the offending party obligingly moves. Trucks drift to the side of road, and flip on their left indicator lights, signaling to Rebe to pass; rickshaws slow down and move over; and even the cows knowingly shuffle aside (and if they don’t voluntarily move, the young boys give them a sharp smack on the side with a stick, tree branch, or rope.) But if there’s no movement, Rebe becomes inpatient. He hits the horn again, but in a longer, angrier blast. In the countryside the roads are clearer, and my attention turns to the show on the side. There are constantly women lining the sides of the roads, with huts or simple displays selling honey (in recycled empty plastic water bottles), fruits, crayfish, homemade rum, crafts, or live animals. As we approach, each woman holds up what they are selling and gestures to our car. I quickly learn that live animals are handled in different ways to keep them docile while they’re being held. Chickens are dangled upside down, held by their feet; rabbits are presented by their ears, held back behind their heads; and ducks are fastened by their wings. There is more activity on the side of the road, but my attention often drifts beyond it, to the beautiful hills and mountains we are traversing. The Malagasy countryside is beautiful, and this trip will take me through farming areas (rice paddies, mainly – all cultivated manually – no tractors here – with cattle pulling sleds to churn the land and women knee-deep in water pulling the rice out), rolling hillsides, and finally rainforest. When we arrive at our destination – a park or nature reserve, or a hotel for the evening – Rebe will often sort everything out for me. He will locate a park guide who allegedly speaks English or arrange the room. We’ll figure out a time to meet up later in the day or the next morning (the hotels here often will give the driver a free shared room and sometimes a complementary dinner as well). He will disappear, and I will explore. I got into Madagascar yesterday afternoon after a couple of restful days in Johannesburg, hilighted by a powerful visit to the Apartheid Museum there. In the eighteen hours I've been in Madagascar, on the street I've been offered - in order of usefulness - a bottle of water, cell phone airtime, a baugette and other foods, clothing, French-language newspapers, calculators, raw meat, bamboo, live animals, and a 40-pound full-scale replica model sailing ship. Tana is a bustling town, and you need to share the streets and narrow sidewalks with cars, rickshaws, and the armies of street vendors walking around. It's, to borrow a word from RSA, quite hectic. Madagascar also seems a bit difficult to navigate. I speak almost no French, and - although there's some English spoken here - have done a lot of pointing and gesturing, and getting around is also tough - there are virtually no street signs and all rental cars come with drivers - it's impossible to drive your own vehicle, though I'm not sure why. I have plans to spend the rest of the day exploring the capital here, then tomorrow I'll head south to spend a few days visiting some national parks and searching for lemurs. I’ve been in Namibia for three days now and have started to compile a list of the positives and negatives about the country. 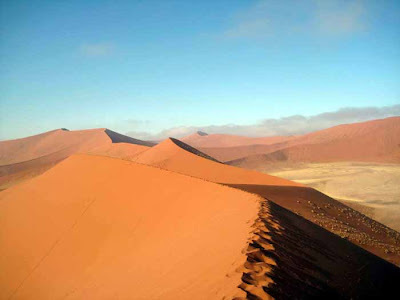 Pros: amazing desert landscapes and scenery; interesting mix of African and German influence; lots of adventure sports options. Cons: long distances; the sand gets everywhere. 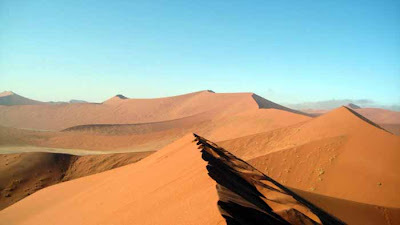 Namibia is vast. Once I got out of the Windhoek capital area on the 450+ km drive to beach, there were barely any people or cars on the road, and nothing but mountains and barren landscapes dotted with small industrial mining towns. (Uranium is mined in the towns I passed on my drive; the diamond mining areas in the south have restricted access.) With 1.8M people (about 600K more than Swaziland, and more than 15x Swaz’ size) and the huge, barely inhabitable Namib desert, it’s the least dense country in Africa in terms of population. 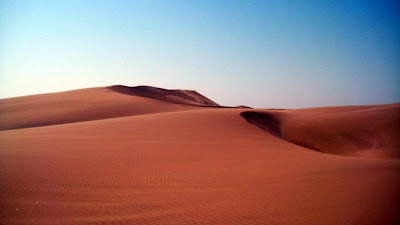 So far I’ve spent most of my time playing in the sand dunes around the beach town of Swakopmund. 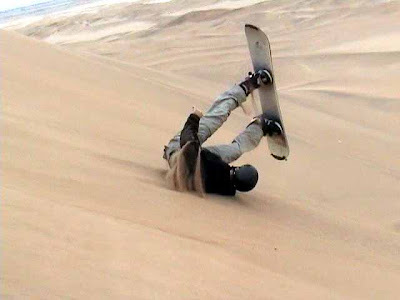 On Thursday I went quad-biking (motorized mini 4x4ing), and yesterday I tried sand-boarding (like snowboarding, but impossible). I took a couple of face plants and have spent the last 18 hours finding sand in all corners (shoes, hair, ears, pockets, nostrils, etc.). Swakopmund is a tourist town, and there’s a strong German feel here in the architecture, restaurants and braushouses, and language. You’re more likely to here German being spoken than English, Afrikaans, or any of the 50+ tribal languages within the country. This country’s too big to see in a week, and I’ve decided to head south and push further into the desert than to drive to the game parks in the north. 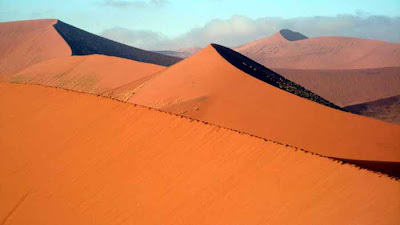 I’ll head out from Swakopmund later today for Sossusvlei in the Namib Desert, and look forward to some hikes in the dunes tomorrow and Monday. Wednesday morning I leave Swaziland. 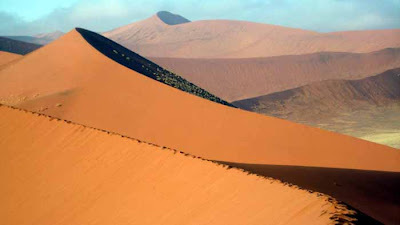 I have three and a half weeks to travel through southern Africa before heading back to New York. I'm looking forward to the trip. If you're in the region, drop me a line.